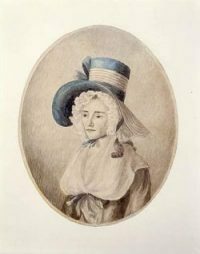 ELIZABETH POSTHUMA GWILLIM SIMCOE and her husband, John Graves Simcoe, were, like so many others, on the move—to a new home. They had been married less than ten years when they departed from Weymouth, England in late September 1791 for Canada, John having been the newly appointed lieutenant-governor of Upper Canada. With them sailed two of their six children: Sophia aged two, and Francis, three months. 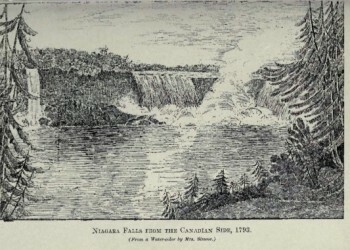 The voyagers reached Quebec in early November, spent a sociable winter there before moving on, via Montreal, to the temporary capital of Newark (now Niagara-on-the-Lake). Born into wealth, Elizabeth Simcoe (1762-1850) was certainly accustomed to more luxury than she found in Canada, but she was quite content in her canvas house with bower of branches for a dining room. She entertained guests there, and gave birth to her daughter Katherine there. Following are excerpts from the diary she kept. T[hursday] 26th  At 9 this morning we anchored at Navy Hall, opposite the Garrison of Niagara which commands the mouth of the river. Navy Hall is a House built by the Naval Commanders on this Lake for their reception when here. It is now undergoing a thorough repair for our occupation but is still so unfinished that the Gov. ordered 3 Marquees to be pitched for us on the Hill above the House which is very dry ground rises beautifully, in parts covered with oak bushes. A fine Turf leads on to the Woods through which runs a very good Road leading to the [Niagara] Falls. The side of our Hill is terminated by a very steep Bank covered with wood a hundred feet in height in some places; at the bottom of which runs the Niagara River. Our Marquees command a beautiful view of the River & the Garrison on the opposite side, which from its being situated on the Point has a fine effect & the poorness of the Building is not remarked at this distance from whence a fine picture might be made. . . .
17th of August I desired to drive out last Evening tho every body foretold an approaching Thunder Storm, which indeed came on with great violence when we were half way to the Landing. I feared that the Lightning would make the Horse run away but he only started at every flash of lightning. The recollection that it was my own determination brought us into danger was very unpleasant. However we got back safe, & in time to save the Marquees from being blown down . . . the Gov. preserved ours by having the Cords held untill the violence of the Storm was over. The Tents were so near the River that we were afraid they would be blown into it. We were so cold & wet we were glad to drink tea. It was quite dark & too windy to allow of our burning candles & when the forked flashes of lightning enlightened the air I was able to drink tea. I wrapped myself up in 2 or 3 Great Coats & intended if the Tent was blown down to take shelter under the great dinner table. The Rain & Wind did not cease for two hours, & we had no means of drying our Clothes & were obliged to sleep in a wet Tent. However we have not caught cold. 28th Nov. Went to the F[or]t. this Morning. Mrs. [Elizabeth Tuck Hayter] Macaulay drank tea with me & I had a party at Whist in the evening. The partition was put in the Canvas House today by which means I have a bedroom as well as a sitting room. These Houses are very comfortable about 30 feet long. The grates did not answer for burning wood & I have had a Stove placed instead tho as yet a fire has not been wanted. The weather is so mild that we have walked in the Garden from 8 till 9 in the Moon light these two last Evenings. . . .
Navy Hall, Feby. 1793 . . . . I was, the greatest part of the winter, in daily expectation of being confined [giving birth]. I have taken the Canvas House we brought from England for my own apartment; it makes two very comfortable & remarkable warm private rooms; it is boarded outside to prevent snow lying on it. The comfort I derived from these apartments was extremely great when I lay in, because being in a manner separate from the rest of the House it was so very quiet. . . .
Elizabeth Simcoe, a petite woman who spoke with a slight stutter, seemed to adapt well to the primitive living conditions first in Newark, and then in York (now Toronto), Canada. She loved the out-of-doors, was an excellent horsewoman, and enjoyed entertaining. A talented artist, she created many wonderful watercolors as well as maps during her stay. Her marriage was a happy one. John Simcoe as lieutenant-governor founded the city of York, introduced trial by jury and English common law, and signed the act abolishing slavery in Canada in 1793. He was granted a leave of absence in 1796; the Simcoe family sailed from Quebec 10 September 1796 but never returned to Canada. Mrs. Simcoe’s Diary, Mary Quayle Innis, editor (Toronto: Macmillan of Canada, 1965), pp. 7, 75, 79, 82, 87. Mrs. Simcoe’s 1790 miniature is by Mary Anne Burges (1763-1813) and is at the Library & Archives Canada. 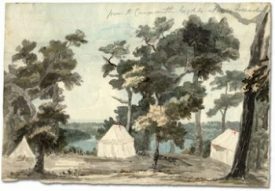 Camps on the heights about Queenstown (July 9, 1793), wash/paper, Archives of Ontario.